This is a card that I created for my mom last weekend. I couldn't post it until she received it in the mail. She was so excited to get it! That is what makes stamping even more fun. 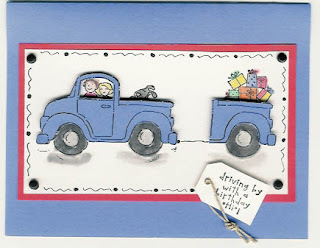 I love when people love the card as much as I love making them. This is a card I created for a male co-worker that just got his doctorate. It is so hard to make a card for men! With women's cards you can put flowers and hearts and all the stuff I love. Everyone is probably tired of seeing these background papers, but it works great for the manly cards. After consulting with my hubby, he told me to keep it really simple and not add all my usual frills. I couldn't find a color of ribbon that looked good, so I colored my white ribbon with my prismacolor markers. It's not as bright as I wanted, but it looks fine. The leaf image, mustard, and brown layers are up on dimensionals. 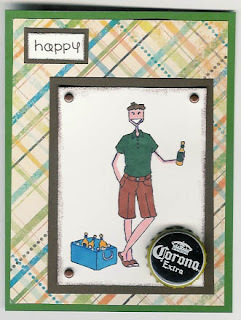 I let Chris vote on the past few 'manly' cards I've made lately, and he really liked the beerfella that I made for Ricky's birthday. So here is another version of that card. 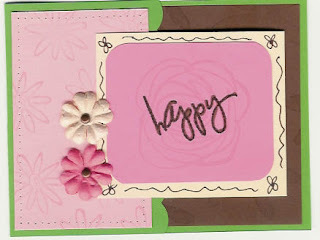 I added a few more elements to it and added the 'happy' sentiment to the front. Inside the card it says 'Birthday'. Stamp: Dust off one of those sets that you have never used and put it to use. I kinda cheated this week and created my card before I created the challenge. I am trying to pull out some of my old sets that have hardly or never been used. 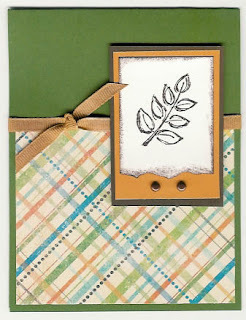 Hopefully this weekend I will make some more cards using other sets that have been collecting dust. I love so many of the new SU sets, but need to use what I already have. Now to figure out what next week's challenge will be. this one done, I need to create this week's challenge. I couldn't figure out how I wanted to use this set, so I followed the SCS Sketch Challenge 123. Hope Adam likes these fishy friends! You know how crazy it is when you get back to work from vacation? Well, it's like that after we've been closed for a week. I really enjoyed last week off, but it's been super busy the past few days! Thank god I finally got a chance to stamp tonight. I've been seeing all these great cards with the new sets and have been dying to get behind my stamping desk! I created this card last week, but couldn't post it until after Mel got it in the mail. 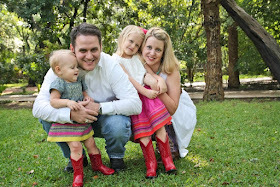 Congrats to Melinda and Nathan for another wonderful anniversary! While Chris is off watching the fight with the boys, I got to do a little more stamping. This card is a birthday card for my brother. His favorite beer is Rolling Rock, so I was forced to drink one so that I could use the bottle cap. The stamp is Beerfella from Stamping Bella. I just love her stamps! I stole the concept for the beer cap from Melinda. Thanks Mel Mel! 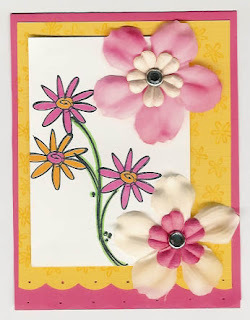 It is my sweet friend Beth Ann's birthday today, so I created this 'sparkly' card just for her. 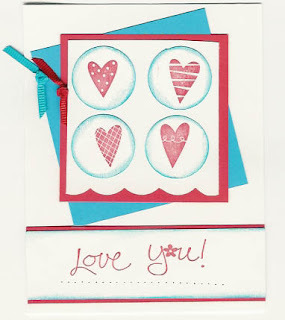 This is another stamp from Stamping Bella. 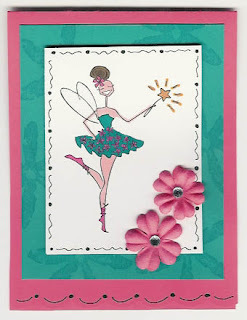 This one was just fun to make with the glitter on her wings and gel glitter pen on the wand. Then add to that the flowers with jewels! What girl doesn't want to sparkle on her birthday!!! Hope everyone is having a great Saturday! This is the start of my creations for today. 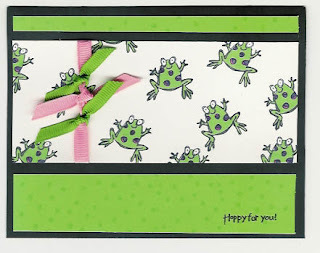 I got the idea for this card from Beate's instructions on how to make the joyfold card. I made this card for a co-worker's birthday, so I figured it was safe to post on here. 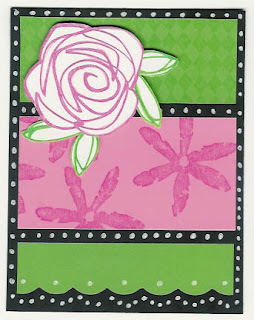 The prima flowers are so much fun to add and I can't wait to use them again. They are holding the front flap of the card closed. 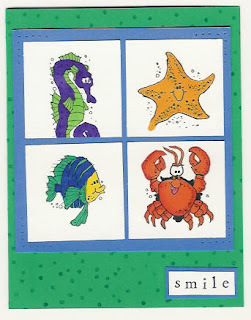 I promise I will try to get better at scanning the cards straight. For some reason I just can't get that right! 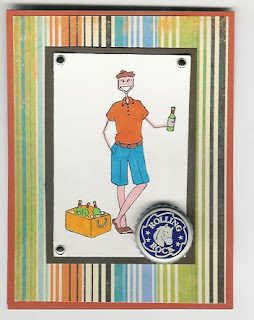 I am always trying to come up with a masculine birthday card and thought the catalog case challenge on SCS was the perfect time to do this. 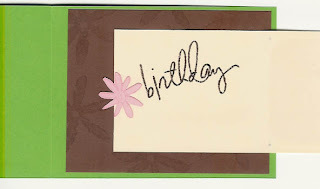 I tried to copy the card from page 52 of the new Stampin' Up catalog, but it didn't come out quite like it should. The little dog in the back looks just like Sadie with her ears flapping in the wind. I actually did this yesterday afternoon, but just now got a chance to post it. So for the first time in days, the rain decided to stop. Sadie, our wiggly black dog, has been climbing the walls during all this rain so I decided to take her for a walk. It was such a gorgeous day and makes me sad to think that I only have two more days until I have to go back to work. This week during the summer really spoils me! 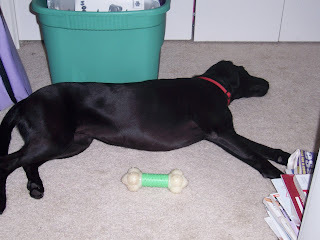 I guess that our walk finally got all the wiggles out of Sadie because this picture is how she looks right now. Now I'm off to cleaning and laundry so that I can stamp something for you later.